The Cottage’s location on Lochan Torr Woodlands estate makes it a perfect place to simply relax and enjoy the beautiful and peaceful surroundings. Guests are very welcome to explore the estate which, along with Lochan Torr a’Garbh-uillt after which it is named, has woodland, with oak, birch, commercial conifers and several acres of native Scots pines, open ground, a trout pond and many pools and burns, providing a haven for wildlife. 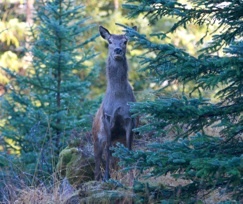 There are views from the estate to Loch Garry and the mountains to the south, west and north, giving many photo opportunities (aside from the two views across Loch Quoich, all of the photographs on this page were taken on the estate, as were the three photographs of deer across the top of the ‘Wildlife’ page). A short but superb cycle or walking route takes advantage of the former (now disused) road to Kyle and the Skye ferry, which borders the north west side of the estate, leading to magical views of Loch Loyne and the mountains beyond. 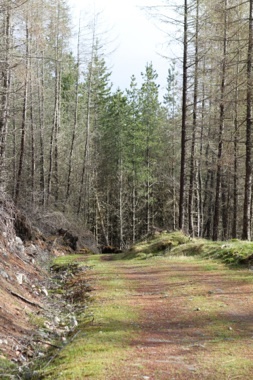 In addition to the track up to the Cottage from the road, there are good tracks leading from the Cottage down to the shore of the estate’s lochan, Lochan Torr a’Garbh-uillt, and east through the woods to a high point, a few hundred yards from the Cottage, from which there are magnificent views down to Loch Garry and west across the estate to the mountains on either side of Loch Quoich.